Electrocardiography (ECG) is a diagnostic method of recording the electrical activity of the heart. This is traditionally performed by attaching electrodes to the skin, which then pick up waveform electrical impulses generated by the polarization and depolarization of cardiac tissue. These are mapped on an electrocardiogram and interpreted to measure heart performance and health. The use of ECGs is ubiquitous and popular among providers, and especially tertiary care hospitals. The Mayo Clinic, for example, performs about 240,000 ECG tests per year in their laboratory, and the global market for ECG machines is set to grow to over $5 billion by 2020. This growth is driven by the wide range of increasingly common conditions ECGs are able to effectively monitor, including heart arrhythmias, anginas, pericarditis, most symptoms of heart disease, the thickness of the heart's walls, the rate and regularity of heartbeats, the size and position of the chambers, and the presence of any changes to the heart's function in response to surgery, devices, or medications. The average cost of a provider-administered ECG test in the U.S., which is comprised of the test itself + the interpretation of results by a trained Cardiologist, is $1,750. As usual, the prices vary substantially from provider to provider, the lowest in the U.S. being $550, and the highest being $3,300. 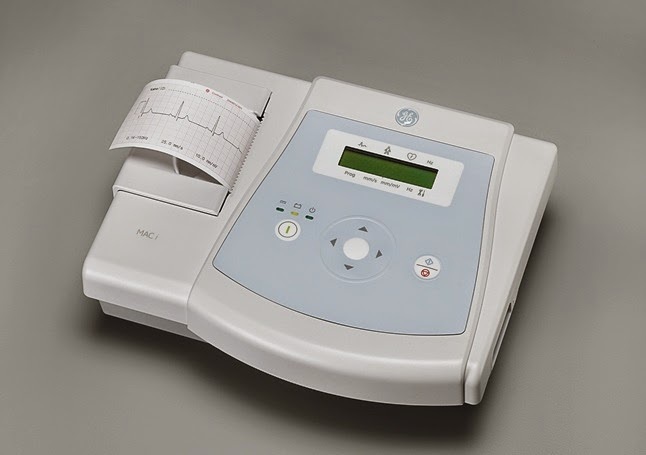 ECG machines vary in diagnostic ability, physical footprint, and price. The current market for these machines can be divided between the 'incumbent' products most of us associate with ECGs, and emerging 'disruptive' products that are portable and less expensive. The incumbents are made by about 16 manufacturers from the developed world, including Burdick, Welch Allyn, Schiller, GE, Bionet, Philips, and Nihon Kohden. They are often equipped for use with 12-leads, often include printing capabilitieg, and they are large enough to be wheeled around. They cost between $1,200 and $3,000 each. ". . . This device has significant limitations in the acute evaluation of chest pain associated with heart attacks. A single lead tracing will miss many real ischemic events, enough that even if it was stone cold normal it would not change our suspicion of myocardial ischemia. If there are significant elevations or depressions, it would probably raise our suspicion for myocardial ischemia, but we would still need a 12 lead ECG, begging the question of how it changes management." Indeed most of the disruptive handheld ECGs above--at least in the U.S. context--have competed against non-consumption by offering patients and homecare nurses the ability to run ECG tests they could not run before. While additional monitoring increases the risks of false positives, the physicians above also concluded such portable testing could be useful for post-operative heart monitoring during convalescence. India has produced a number of 12-lead handheld ECGs that may be more disruptively positioned than the 1-lead ECGs above, which begin to look like 'hobby devices' in comparison. One of the first major advances was GE's famous MAC India model released in 2007, which brought the price down to $500 from $2,000 - $10,000 for their other hospital-grade ECG machines. In the past 8 years, other Indian companies have released 12-lead ECG devices that achieve greater portability, as well as allow for diverse methods of test data transmission, remote analysis, and storage. Maestros Mediline launched the E UNO R-10 device in 2010 in partnership with Vodafone. The device relied heavily on Blackberry phones, and was designed mostly for remote consultation use, just as ECGs are in the U.S., except that ECG technicians in India will often travel to administer tests, the results of which are then transmitted to a centralized doctor at a hospital for interpretation. Developers have built applications allowing for use on the Android platform, but the device was not less expensive than GE's MAC India, costing about $500. 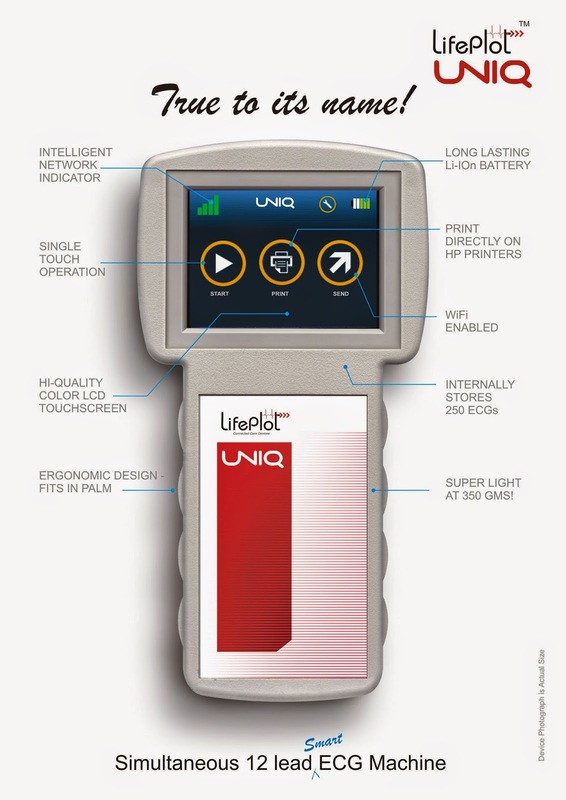 Lifeplot CCD1 was another offering developed in Pune, India, that does not rely on any specific network or device for transmission of test results, making it potentially more versatile. 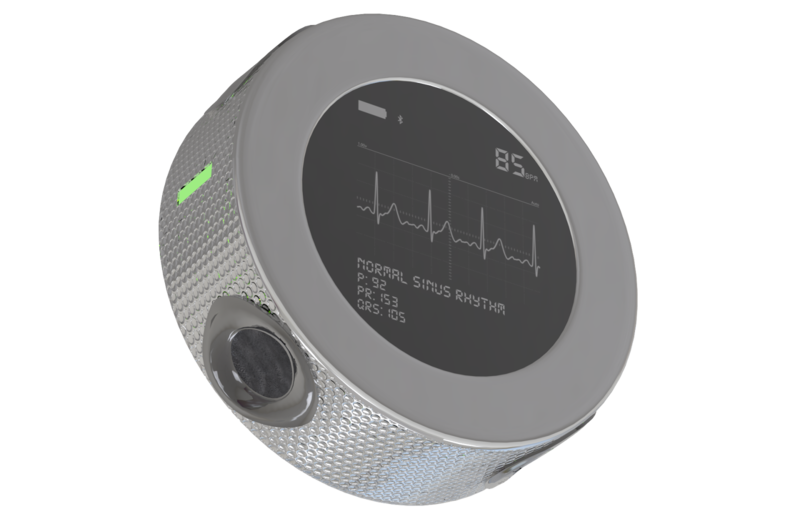 Though the original model was more expensive at $2,000, LifePlot released a more advanced product just 2 years ago for only $700. The prices for these devices have likely come down, but there are less feature-rich ECG devices appearing in the Indian market from both indigenous and international sources. AliveCor has signed an exclusive agreement with the highly respected Apollo Hospitals chain to use its ECG technology for clinical tests, begging the question about whether the U.S. cardiologists' review of AliveCor's limitations above reflects incumbent biases more than solid clinical rejection, whether something is just better than nothing for India, or whether AliveCor's 1-lead technology has reached a point of relative parity with 12-lead testing. At a price point of $75, perhaps the tradeoff of some marginal performance is worth it. The appearance of the indigenous Sanket PiE by Agatsa follows past patterns of the introduction of disruptive technology into the Indian market by foreign firms, followed by the release of indigenous versions which may or may not be better-suited for indigenous market conditions. 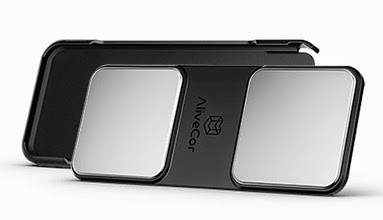 Since Sanket is not yet available on the market, it's not clear what the price will be, but it will presumably be comparable to AliveCor. One of the most immediate differences between the handheld ECGs being widely sold in India vs. those in the U.S. is that they are 12-lead ECGs, while those from Dr. Grier's page are all single-lead devices. This signals a serious disruptive position relative to traditional ECGs in the Indian market, which is a nice illustration of how the context of innovation shapes its ultimate shape. Many elements of the Indian market demand a fully functional, low-cost, handheld ECG: Sheer in-affordability of existing technology for huge numbers of needful patients, the necessity of portability for ambulatory community health workers, and a large supply of IT talent. Would the U.S. Benefit from Adopting Indian ECG Technology? The U.S. market context is much different from that of India, which explains the strategies of handheld ECG devices like AliveCor, Scanadu, and Wello, which--so far--have not competed directly against incumbent technologies, preferring instead to position themselves mostly as patient-centric devices for self-use, providing only supplemental data to traditional provider-based ECG machines. This could still represent the beginnings of disruption, which often incubates in a foothold market that can sustain a nascent technology until it improves to the point of dominance across all or most of the dimensions of quality that matter to customers. At that point, the incumbent technologies quickly fade away. This is the story of transistor radios disrupting vacuum tube radios throughout the 1950s and early 1960s. However, one of the biggest issues behind lack of serious medical adoption of handheld ECGs in the U.S. is that the alternative processes / delivery models are not yet in place for the use of these machines within provider settings, whereas in a market like India, the new devices are often competing against non-consumption, so in many cases they've had much more 'experience' in serious clinical use. What might the U.S. learn from the delivery models that have emerged around the use of these portable devices? Adopting leaner delivery models and technology is likely where the real savings lie, but even if the U.S. were to switch over to the equivalent technology available in India today, substantial savings would immediately materialize. Just taking GE's MAC India at a $500 price point, if the average price of an incumbent machine is $2,000, and each of the 7,000 hospitals in the U.S. purchases 5 new ECG machines per year (as benchmarked against the yearly purchases of a UK hospital with 5 sites), this results in over $50 million in yearly savings on equipment costs alone, not including the lead replacement cost, which is also material judging from the UK hospital's spending. What barriers prohibit the U.S. from purchasing lower-cost ECGs for clinical use? "I agree that American "incumbent" 12-lead ECG machines are over-priced, partly as a result of being more complex than they probably need to be and what I call over-engineered. I think much of it is also simply greed in the American health-care system and marketing aspects. Some of the expensive complexity also results from having to deal with a current environment of excess US federal government bureaucracy rules and regulations related to privacy and security along with legal and insurance issues, including liability. In short, it's a very tangled mess! However, there are also legitimate reasons for some machines being more expensive, including research, development, and continuing revision of analysis algorithms to keep up with new research and information. Regarding 1-lead versus 12-lead issues, the main concern involves the angle of view. A 1-lead machine only gives one view whereas a 12-lead gives many more views and a much more complete picture of the electrical activity of the heart. Single lead views are useful only for rhythm information and timing aspects. Single lead views are not complete enough for all of the many other aspects of heart functioning. Thus, unless a physician is focusing on rhythm issues, such as atrial fibrillation, the 1-lead does not produce enough information. Even typical 10-second 12-lead ECGs also are not always sufficient to confidently diagnose many conditions. Sometimes additional leads and/or different locations on the body for electrode placement are needed, recordings of longer than 10 second duration, and additional types of tests such as stress tests, echocardiograms, cardiac CAT scans, etc. The GE MAC i is interesting and the portability and low cost are nice features but it has two problems in my opinion: (1) it doesn't appear to currently have connections for uploading records to a computer for further storage and working with and (2) the narrow roll paper printout is inefficient for reading, filing, and long-term storage compared to standard 8 1/2 x 11 inch sheets with all 12 leads plus a rhythm strip together on one flat page that is easy to read, work with, and file for future reference. 12-lead standard ECG machines and 1-lead handheld devices have different functions and are not really comparable, as we say, like trying to compare apples and oranges. Although the new handheld devices are new and different to an extent, American health-care has long used somewhat similar devices called event markers and Holter ECG recorders for the functions that the newer handheld devices cover. Event markers are 1-lead systems sent by physicians with their patients to be used at home for monitoring purposes. Holters, most of which have highly developed software programs and analyses, are still commonly in use. 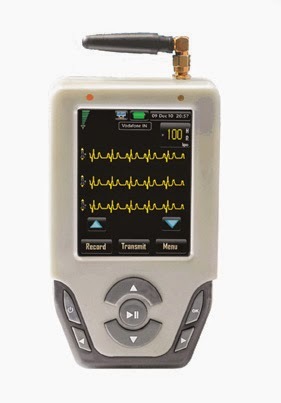 Many of the handheld devices have long-recording Holter capability, but still just one channel (as opposed to 3 to 5 or more on most regular Holter systems) and much simpler and less analytical software." Healthcare diagnostics industry is no different than Pharma industry. Both the industries are dominated by a few companies. And, in the name of providing quality healthcare, both the industries have been offering expensive solutions. There are several lower cost 12-lead ECG machines are coming to market at significantly lower price than those from GE and others, these are networked connected solutions so that consultation with specialist can happen instantaneously and digitally stored information can be easily analyzed using Big Data algorithms. It is about time, medical diagnostics came out of the dark ages and start taking advantages of IT more efficiently. I loved your article. There were many information on medical office IT. So thank you for providing these information. This was really useful to many people like me. I was wanting this type of technical help in my business. 20+ Facts About Healthcare Costs in the U.S.